Arnold Georges Johnson died on September 10, 2015, at the St. Boniface Hospital in Winnipeg, Manitoba. He leaves behind his son, Arnold Johnson and his wife Lori, his daughter, Muriel Njegovan and her husband Bob, his younger son, Mark Johnson and his partner Sheila, and his youngest daughter, Anne Marie Johnson and her husband Terri. He will be greatly missed by his grandchildren Milica Weiler, Katarina Stevens, and Milan Njegovan, Jennifer Johnson, Andrew Johnson and Robyn Johnson, as well as his great-grandchildren Kane, Liana, Abby, Scott and Kira. Arnold was born June 1, 1923 in Preeceville, Saskatchewan to Andrew and Gusta Johnson. He was the youngest of six children. Arnold grew up on Canadian Prairies with all the wonders and hardships that came with it. As a result of this life education, he grew up to be a man of many accomplishments. One of his first loves was reading. It was a passion that stayed with him the rest of his life. During the war, he served overseas as an aviation mechanic. When he returned from the war, he and his brother Gilbert owned and operated the Johnson Brothers Garage in Swan River, Manitoba. It was during this time that Arnold met, courted and married the love of his life, Gladwys Eva Burke. Together they had four children, Arnold, Muriel, Mark and Anne Marie. Over the course of years Arnold moved through a number of careers. He was a man of many talents. Not only was he an aviation mechanic and garage owner / operator / bookkeeper, he was also an accomplished carpenter, a minister, a counselor and teacher. As he put it, he was a “jack of all trades and master of none”. There are many who would disagree with that statement, for when he decided to do something, he always researched it and did it well. Arnold was passionate about the pursuit of knowledge, the Christian faith and caring for those in need. He and his wife, Gladwys, always put the needs of others before themselves. They were a true partnership in every sense. Church of the Ascension, Stonewall, Christ Church, Stony Mountain, St. Peter, Balmoral, All Saints, Wpg; St. Luke, Balsam Bay, St. Jude, Grand Marais, St. Michael, Victoria Beach; St. Aidan, Wpg., St. James, Beausejour; St. Barnabas, Wpg., St. John’s Cathedral, St. George, Woodlands, and held license as “Special Assistant” to Bishops Jones and Lee. Arnold loved the outdoors. He enjoyed cycling, canoeing, sailing, and camping. Arnold was a devoted husband, and loving father and grandfather. He will truly be missed. A service to celebrate Arnold’s life will be held at All Saint’s Anglican Church, 175 Colony Street (Broadway & Osborne), Winnipeg, Manitoba, at 1:00 p.m. on September 19, 2015. There will be a reception in the church hall following the service. 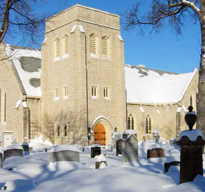 A private family interment will be held at Holy Trinity Anglican Cemetery . Parking for the service will be available at the rear of the Great West Life building across from the church; remember the row closest to the office building is reserved 24/7. In lieu of flowers, please send donations to ‘Agape Table’ in care of All Saint’s Church. As published in the Winnipeg Free Press on September 16, 2015.